has been known to do ever since its first public appearance. exploitation. Later Wittgenstein’s were. Austin’s were not. doctrines but due to their sociolog ical doctrines” (Katz, 1978: p.
should not even belong to the field proper? made between them, since they are essentially incomparable. success was a like product will no longer convince any one. planatory wealth and what have you. Now we know better. with Austin, which perhaps shouldn’t have, for either of them. 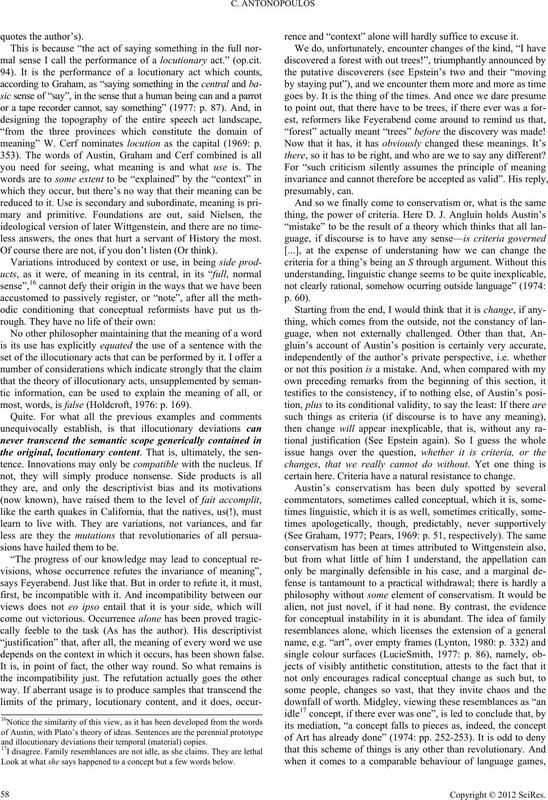 descriptivism, context-dependence, in ne r li f e a n d, f in a ll y , r e al i sm . In a word, the lot. their differences over the relation between Meaning and Use. (... how to use it). Sense (2): The meaning of a word is its use-S. Sense (3): There is no more to meaning than use. Sense (5): If there is use, then there is meaning. of the ordinary use (Findlay, 1976: p. 118; italics in the original). and we must look for nonclassical senses instea d.
leave little room for doubt). conservative and he differs from him even in this. more innocent looking, qua more technical, term be preferred. hesitation, so I am exonerated. are birds of a feather. ologists of knowledge, Gadamerian hermeneuticists and the like. where semantics yields its place to human rights. phenomenon other than those belonging to Philosophy . introduced a new language game. why bother with them in the first place? cies prevailing in this last, but not least, frame of the motto. central figu r e of a l l reli g i on. about. It’s there, so it’s valid, no matter what it may be. languages. Which is chapter two of the language-game bible. which they commonly spring forth. Last chapter of the bible. We began doing semantics and ended up with human rights. as it is (1968: p. 49e). Foundationalism is out and there are no “timeless” answers. There are no ahistorical standards of rationality and objectivity. thing rather than another (Nielsen, 1987: p. 5). validity (Nielsen, 1987: p. 9). author simply quotes. So who should I address this comment to? Olympics, but merely cross the 20 paces to his own bathroom. as these: “Can’t you read the bloody sign?” “No; I’m blind”. produce it. They must either put up or step down. 9“Sir, our will is free and there’s an en on’t” he is reported to have ... argued. known one o n t op of it. as Dr. Johnson would exclaim in joyous, paternalistic dismissal. Here is another.12 God either cannot stop evil, or He will not. If he cannot, he is not almighty. If he will not, he is not all kind. what he is really talking about in spite of everything. always be the one side that does all the noting. cized in the original (just in case one missed the point)]. sions for which no direct observational reasons are available. tific change [Ibid: p. 34]. Flandern, 1994: p. 24; italics in the original). 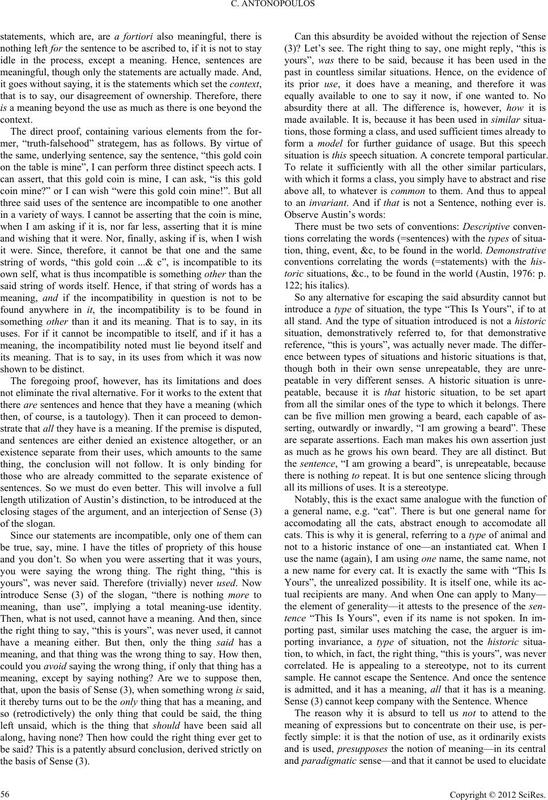 expanding space.” (Harrison, 1993: p. 30). 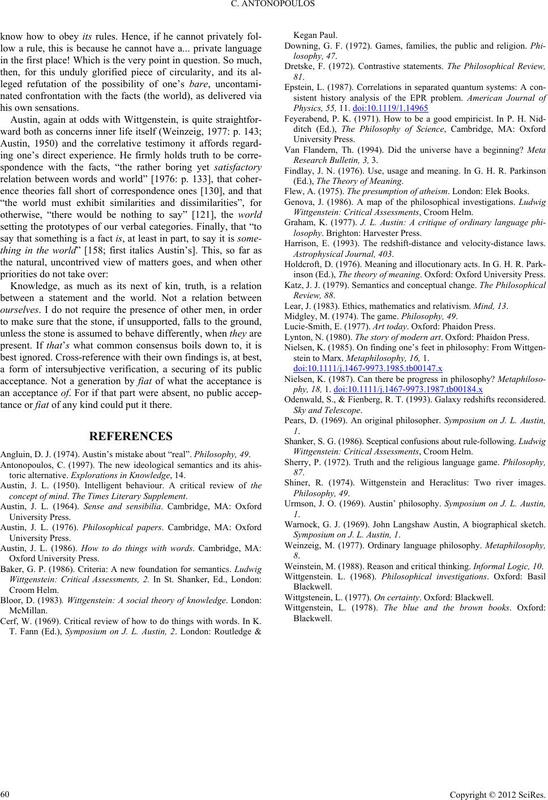 12Quoted in The Presumption of Atheism, by Anth. Flew [1976: p. 81]. valid (Feyerabend, 1968: p. 38). what they are talking about. This language game is played. entered their minds (Epstein, 1987: p. 970). 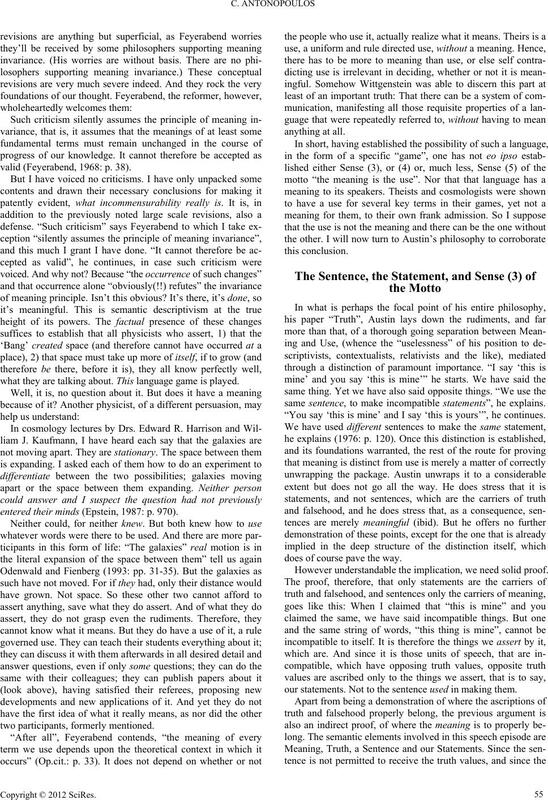 same sentence, to make incompatible statements”, he explains. “You say ‘this is mine’ and I say ‘this is yours’”, he continues. does of course pave the way. However understandable the implication, we need solid proof. our statements. Not to the sentence used in making them. meaning, than use”, implying a total meaning-use identity. the basis of Sense (3). situation is this speech situation. A concrete temporal particular. to an invariant. And if that is not a Sentence, nothing ever is. toric situations, &c., to be found in the world (Austin, 1976: p.
all its millions of uses. It is a stereotype. is admitted, and it has a meaning, all that it has is a meaning. 1976: p. 118; first italics the author’s). can be use devoid of meaning-which is a use. ing reduces to use, and use is variant, meaning is variant. men-surability, incommensurable uses will be meaningless. 1) George borrowed the car yesterday (Not John). 2) George borrowed the car yesterday (He did not steal it). 3) George borrowed the car yesterday (Not the motorbike). 4) George borrowed the car yesterday (Not today). genuine semantical difference” . My sentiments exactly. tence.14 The (invariant), “George borrowed the car yesterday”. sense (Austin, 1986: p. 109). a sentence, already made potentially available by the language. to be taken, otherwise severe misunderstandings may occur. compelled to acknowledge its presence, though I might perhaps “note” it. throw them in to relief. but implied deployments of it. tionary act, which occurs at a post-sentential but a pre-assertive stage. 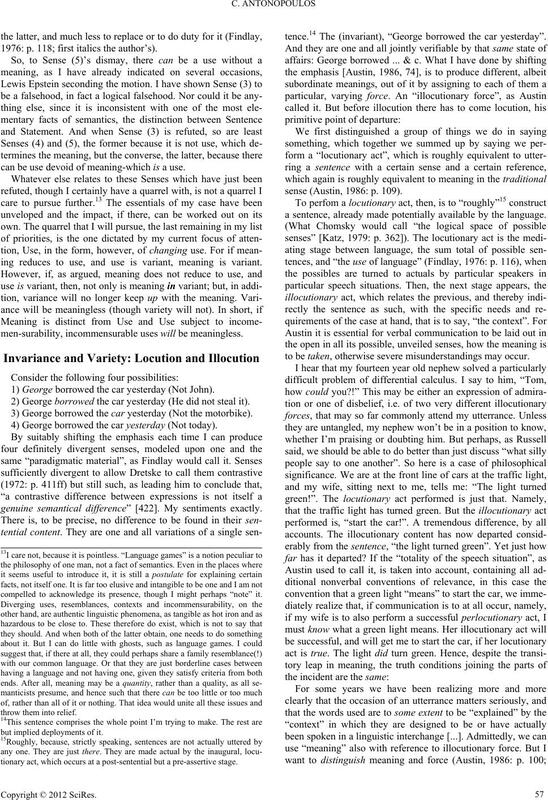 mal sense I call the performance of a locutionary act.” (op.cit. meaning” W. Cerf nominates locution as the capital (1969: p.
less answers, the ones that hurt a servant of History the most. Of course there are not, if you don’t listen (Or think). most, words, is false (Holdcroft, 1976: p. 169). sions have hailed them to be. depends on the context in which it occurs, has been shown false. rence and “context” alone will hardly suffice to excuse it. “forest” actually meant “trees” before the discovery was made! there, so it has to be right, and who are we to say any different? certain here. Criteria have a natural resistance to change. and illocutionary deviations their temporal ( material) copies. Look at what she says happened to a concept but a few words b elow. plicity in both space and time and, hence, of their incessant flux. [1968, 11e].18 Shiner compares Wittgenstein to Heraclitus. right when they should. But this is only illusory. derline-case argument could not even be stated. his italics], that we have no safer access to the nature of things. disinterest in him and so of their ignorance of his real views. tion with that of the others can only be just that; a coincidence. which the “attack” was greeted. to Kripke (as quoted by Shanker). view” of rule following (Shanker, 1986: p. 176). forbids, is the possibility of one’s private contact with reality. ence between him and Aus ti n, and truth, I know not wha t i s.
will continue doin g so indefinitely. tance or fiat of any kind could put it there. Angluin, D. J. (1974). Austin’s mi stake about “real”. 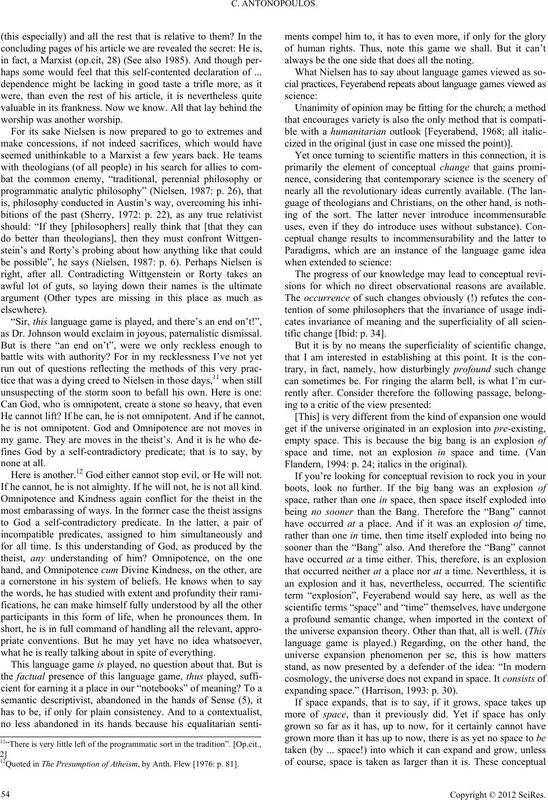 Philosophy, 49.
toric alternative. E xp lor at io ns in Knowledge, 14.
concept of mind. The Times Literary Supplement. Cerf, W. (1969). Critical review of how to do things with words. In K. (Ed. 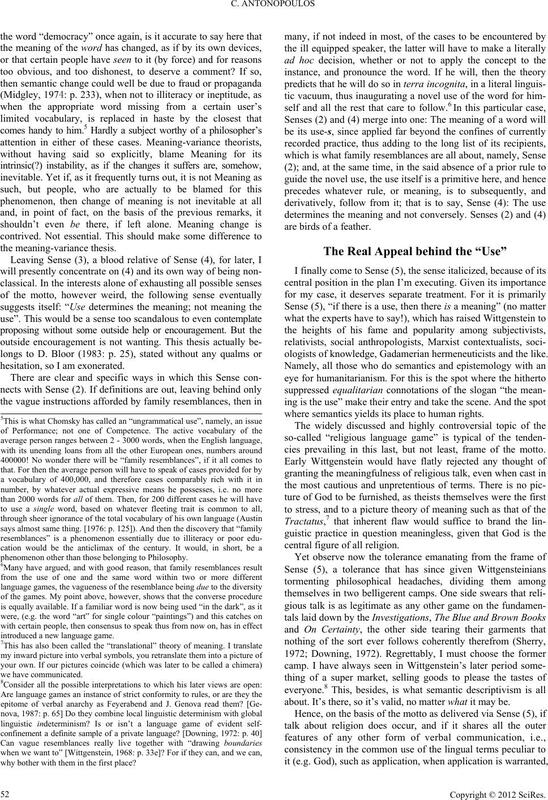 ), The Theory of Meaning. Flew, A. (1975). The presumption of atheism. London: Elek Books. 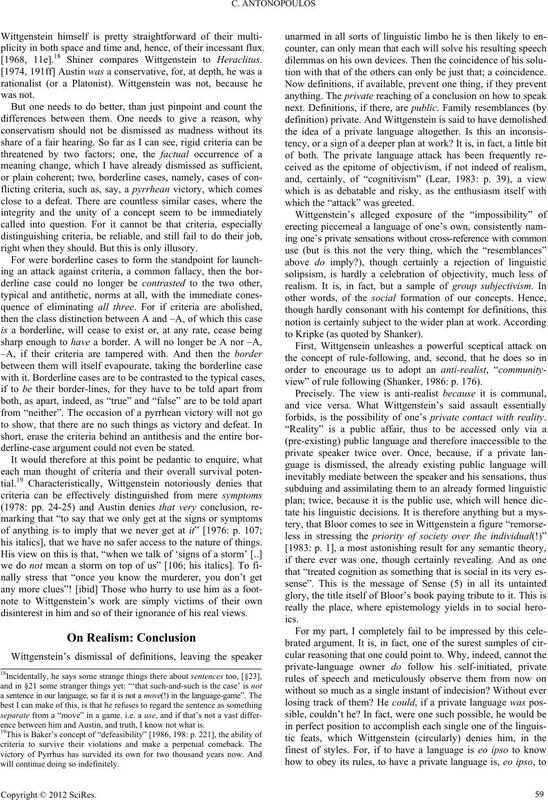 Wittgenstein: Critical Assessments, Croom Helm. Harrison, E. (1993). The redshift-distance and velocity-distance laws. inson (Ed. 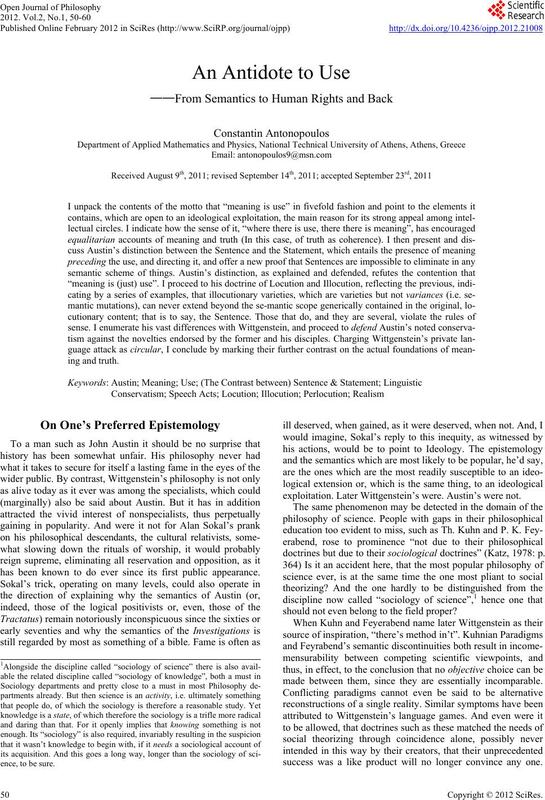 ), The theory of meaning. Oxford: Oxford University Press. Lear, J. (1983). Ethics, mathematics and relativism. Mind, 13. Midgley, M. (1974). The game. Philosophy, 49. Lucie-Smith, E. (1977). Art today. Oxford: Phaidon Press. Lynton, N. (1980). The story of modern art. Oxford: Phaido n P ress. stein to Marx. Metaphilosophy, 16, 1. Odenwald, S., & Fienberg, R. T. (1993). Galaxy redshifts reconsidered. Shiner, R. (1974). Wittgenstein and Heraclitus: Two river images. Warnock, G. J. (1969). John Langshaw Austin, A biographical sketch. 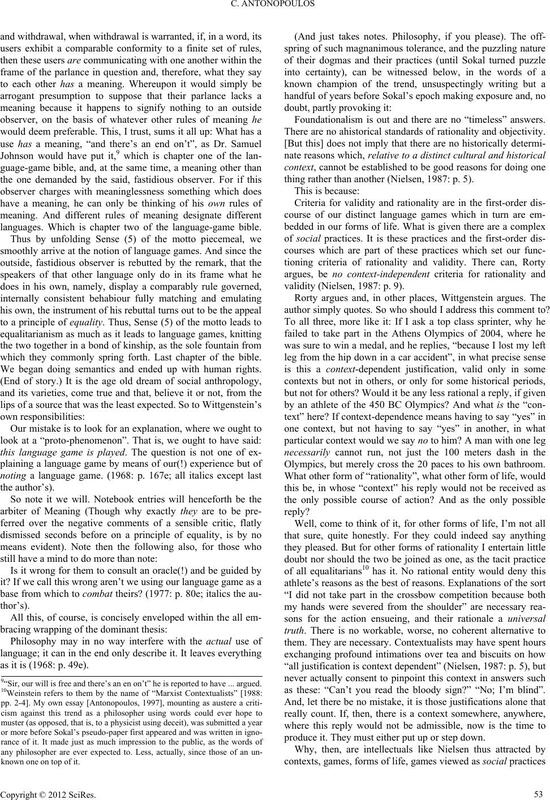 Symposium on J. L. Austin, 1. Weinstein, M. (1988). Reason and critical thinking. Informal Logic, 10. Wittgstenein, L. (1977). On certainty. Oxford: Blackwell.